Schwabisch Hall is a very attractive University town with a medieval village at the center, located along the Kocher River in the state of Baden-Württemberg in southern Germany, near tourist favorite Rothenburg. Schwabisch Hall is a stop on Germany's popular Castle Road. Sometimes the name of the town is shortened to simply "Hall," referring to a fountain of salt; salt production was key to the early history of Schwabisch Hall. Salt was distilled by the Celts as early as the fifth century BC. There are about 36,000 people living in Schwabisch Hall. It's easy to get around; having a car in Schwabisch Hall isn't a problem. Bahnhof Schwäbisch Hall - Hessental is the name of the train station. Schwabisch Hall can be accessed by either the large Frankfurt/Main airport or the smaller Stuttgart airport. You can take the fast train--the ICE express train directly from the "Frankfurt-Flughafen Fernbahnhof" railway station at the airport--to Stuttgart. From the Stuttgart main station, you can take the Regional Express to Schwäbisch Hall-Hessental. Total journey is approximately three hours. Schwäbisch Hall is on the A6 Heilbronn-Nuremberg Autobahn. Look for the Kupferzell-Schwäbisch Hall exit and follow signs to the "zentrum". To get to Schwabisch Hall from Munich, the route takes you through the Nürnberg Hbf. You'll find tourist information behind the fountain at Am Markt 9, in front of St. Michael's church. Schwabisch Hall is a small town, so you'll want to reserve a hotel early if you're going in the summer or during a festival. 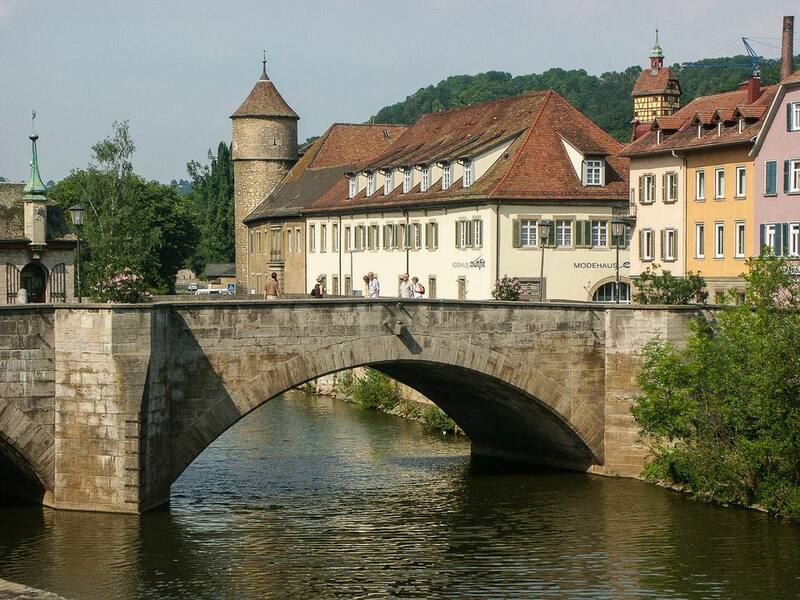 HomeAway offers a few Country Vacation Homes in Schwäbisch Hall County if you wish to stay along the castle road and enjoy the rural side of Germany. Schwabisch Hall is a very attractive town to walk around in. You'll want to start at St. Michael's church, which dominates the skyline, as was built in 1156. Go up in the tower to get a good aerial view of the town. Market square, in front of the church, is where the action is, and includes a theater, gallery, several restaurants, a hotel, and numerous shops. From there you can stroll downhill to the river, following its meandering and select from one of seven covered bridges to cross over to one of the islands. On one island is a replica of Shakespeare's globe theater called the Haller Globe theater, which has a very pleasant beer garden in front of it, with tables scattered about on the lawn. Every year at the end of summer Schwäbisch Hall celebrates the night of nights. The extended town park along the river changes into a sea of lights, and there are fireworks. Schwabisch Hall is a wonderful and relaxing change from more touristy Rothenburg but fills with tourists during its summer festival. On Whitsunday (Pentecost, 50 days after Easter) locals dress up in historical costume for a dance festival celebrating the old means of salt production, which made Schwabisch Hall a wealthy village in antiquity. It's a festival that's been going on since the 14th century! Schwabisch Hall is quite an attractive town!